This unit provides a panoramic view of the ocean framed by palm trees from the living/dining and kitchen areas through twelve foot sliding glass doors. 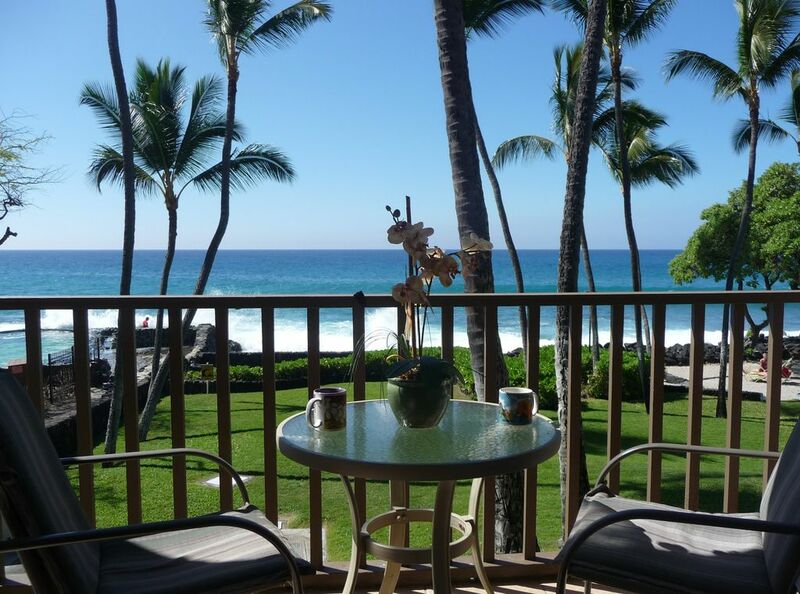 Relax on the expanded private lanai overlooking the surf, marine life and unsurpassed Kona sunsets. This second floor end unit in the desirable beachfront "E" building is quiet, secure and private. Full remodel completed in 2014 provides a bright and contemporary feel that is open to the view and ocean breezes. The updated kitchen features a dishwasher and eating bar. The ceramic tile bathroom has a walk-in shower. The bedroom includes a wall of windows that can be opened to the trade winds and the sound of near-by waves. To help you enjoy your visit, there is beach gear, binoculars to watch passing whales (in season), guidebooks and a reserved stall in an adjacent lighted parking area. The unit has secure wi-fi for excellent phone and computer connectivity. We have assembled an on-island team that takes pride in ensuring that everything is extra clean and in good repair. Kona Isle delivers the old Hawaii that visitors dream about. It is a small, intimate resort of low rise buildings nestled in lush, pristine landscaped grounds. A heated fresh water swimming pool next to a private beach area affords plenty of space to soak up the sun or relax with a book from the Kona Isle library. There is also an adjacent ocean-side surf fed pool. Gas bar-be-ques are maintained for your use in a lighted ocean front picnic area, a favorite gathering spot for sunset viewing. Kona Isle is a non-smoking & no pets faciliity. Kona Isle is situated in the heart of the Kona coast on the ocean side of Ali'i Drive about 1 1/2 miles from Kailua-Kona restaurants, shops and nightlife. Both a convenience store and farmers market are within a 1 block walk. The Alii Drive shuttle bus also stops near-by. Some of the island's best snorkeling and surfing spots are less then a ten minute drive. The laid back, serene ambiance within the complex coupled with the convenient location accounts for the many repeat visitors. This unit puts you out front, right on the ocean -- no roads to cross, no buildings restricting your view, no vehicles parked in sight. How close is the ocean? Check out the photo section above to access a panoramic video taken from the lanai of some winter waves. Stacked washer/dryer with capacity larger then found in most units - new in 2012. Reserved parking space in adjacent lighted lot. Complex is known for it's landscaping and large expanses of grass. This unit has an enlarged private tiled balcony with outdoor table and seating for 4. Heated freshwater pool. A salt water ocean fed pool is adjacent to the complex. We loved this condo!! The ocean view was great and having breakfast on the porch was a great way to start each day. I would highly recommend this condo. The only thing we enjoy more than breakfast on the lanai, is relaxing with a glass of wine at the end of the day while watching a Kona sunset over the ocean. Knowing your visit was part of a very special 50th Anniversary trip, we so pleased you loved it. This unit is a gem...the view is spectacular, the sound of the surf crashing against the shore is wonderful and the condo is fit-out very comfortably. There was so much to love here, we would definitely go back. We're so glad you enjoyed your stay and would welcome you back anytime. Mahalo for your five stars and we're happy you had such a wonderful stay. We certainly hope you'll be able to visit again. What a wonderful place to spend the week. The whales put on an incredible performance of tail slapping for 5 minutes. Jim and Penny's condo is comfortable and up to date. would return in a heartbeat. The Cooks. When whales appear they're not announced in advance so being able to eat and relax on a lanai that overlooks their stage helps insure you see them. Given the distance you traveled for the show, we're glad you were impressed by their performance and enjoyed your stay. Although we try to portray our condo just as guests will find it, we get asked at least a couple of times a month if that's really the view. As you found out, being on Alii Drive in Kailua-Kona is probably the best location on the island, particularly if you desire a unit right on the oceanfront. You were great guests and we look forward to having you return. The view from this condo can’t be beat. Loved watching the waves crash into the salt water pool. Location was perfect for exploring the island. Thank you for sharing your little piece of paradise. Thank you for choosing to stay at our condo and hope to have you visit again.